Historians still debate whether President John F. Kennedy would have withdrawn U.S. troops from Vietnam had he lived to win re-election in 1964. Since President Barack Obama recently announced his intention to keep at least 8,400 U.S. troops in Afghanistan through the end of his presidency, the only debate will be over why he never withdrew but chose instead to bequeath an unwinnable war — the longest in U.S. history — to his successor. The U.S. war in Afghanistan will officially pass the 15-year mark in a few months. But like Vietnam, where the United States began aiding French colonial forces in the late 1940s, Afghanistan has been the target of Washington’s war-making for more than three-and-a-half decades. President Obama explicitly rejected any analogy to Vietnam in a speech nearly seven years ago. But like Vietnam, our ongoing conflict in Afghanistan has become a hopeless quagmire, marked by official lies, atrocities, pervasive corruption and poorly led government forces who survive in the field thanks mainly to U.S. bombing. Like Vietnam, Afghanistan represents a staggering waste of lives (more than 300,000 direct casualties through early 2015) and resources (more than two trillion dollars). The same logic is what keeps gamblers coming back to Sheldon Adelson’s casinos year after year to lose more money. In Vietnam, the United States couldn’t win with more than half a million troops. In Afghanistan, the United States couldn’t beat the Taliban with 100,000 troops. Obama doesn’t really think he can win with a mere 8,400 troops — especially with the Taliban making steady gains. In Indochina, of course, all of our furious bombing, which unleashed three times the tonnage dropped in World War II, only hardened enemy resistance. Recent studiesconfirm that the bombing was ineffective and drove civilians into the arms of the Viet Cong, just as U.S. bombs, drones and night raids build support for the Taliban. Massive bombing could not make up for the unwillingness of South Vietnamese troops to risk their lives for corrupt leaders. As in Vietnam, which became known as the “dirty war,” Afghan officials have pocketed tens of billions of dollars earmarked for infrastructure and institution building. They also encourage rampant trafficking in opium and heroin, as do the Taliban. The Taliban, however, use their profits to finance their insurgency, rather than siphoning them off to Dubai, where the families of leading Afghan officials maintain fat bank accounts and luxury villas. 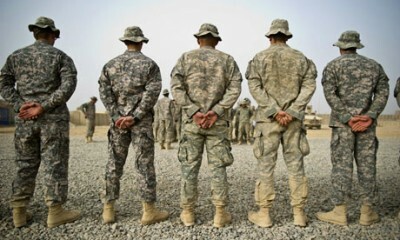 Much of Afghanistan’s army consists of “ghost” soldiers and officers, who draw pay that enriches corrupt Army leaders. In some provinces, nearly half of all police are ghost employees as well. Meanwhile, real soldiers are busy selling tens of thousands of U.S. weapons to the Taliban. Others fire their weapons at no one in particular so they can sell copper ammunition casings on the black market. Highly motivated Taliban forces are particularly tough to beat because they get refreshed and resupplied from bases in Pakistan, where their leaders reside. One of the key lessons of the Vietnam War was the near impossibility of defeating a determined insurgency that enjoys neighboring sanctuaries. In Vietnam, at least, U.S. leaders pursued negotiations with the enemy to end the conflict. In Afghanistan, no one is sitting at the peace table, and the U.S. drone strike that killed Taliban leader Akhtar Mohammad Mansour in May was hardly a welcoming invitation from Washington. The Taliban and their unyielding allies are to blame as well. In June, Gulbuddin Hekmatyar, leader of one militant Islamist faction, demanded that the Kabul government send all foreign troops home and disband itself. Ironically, he was America’s (and Pakistan’s) primary ally during the war against the Soviet Union, despite (or because of) his reputation for pathological brutality and leadership of Afghanistan’s drug trade. So much for grateful allies. So why doesn’t Obama just get out? That worked in Vietnam, which Washington today is courting as an ally. But like many CEOs today, Presidents think far more about the immediate future than about outcomes long after they leave office. President Obama knows full well that the Republican attack machine will go after him and other Democrats if he “loses” Afghanistan or Iraq, despite public ambivalence about both wars. So his calculated decision to keep fighting, at minimal cost and without any real hope of winning, makes political sense. But his policy is also cowardly and immoral. President Obama — and his current secretary of state — should recall the testimony of former Navy Lt. John Kerry before the Senate Foreign Relations Committee in 1971.